Donald G. Cartys brilliant "Your Personal Road Map for Success" eWorkbook PLUS his collection of 60 of the Greatest Self Help, Success, Spiritual & Personal Transformation PDF eBooks available online. "The Master Key System" by Charles F. Haanel - This 24 Lesson Book was inspired by Wallace D. Wattles philosophy. Why buy now? Because right now you can begin to build and experience a whole new fulfilling life. One you will embrace and treasure for having the courage to discover. You can begin that new life by having Your very own Library for Personal Success. 61 of the Greatest Classic self help ebooks ever written. From timeless Sages to present day Gurus these books distill Centuries of Wisdom into some pretty hard hitting and important messages. 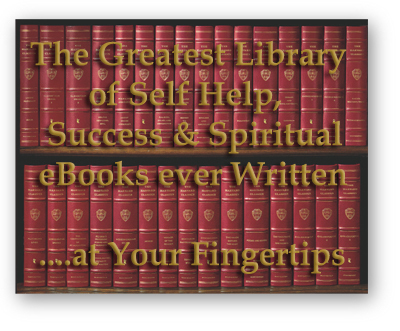 Your very own Library for Personal Success. Own the Greatest Library of Self Help, Success and Spiritual eBooks available online. Imagine landing on just one solution that catapults you to a life you always wished you'd have, one that's abundantly rich and rewarding in every facet. That solution exists. In fact, it exists today, this very moment - in your own mind! Every person walking this planet carries this key, but few know how to plumb their minds depths to excavate a more rewarding life for themselves. Your better life is already housed within you. It doesn't matter how you grew up, or what you've struggled with in life - your mind is unscathed by any circumstance you've yet lived...and it's phenomenally powerful! This collection of Classic self-help ebooks show you how to excavate the wonderful gem of your mind. Learn from the Classics (as millions before you) how to believe in and act out the greatness of your own mind. These are the full versions written by the original authors. You get the entire Library at one time. Keep in mind that these books are sold on the internet (if you can find them!) for up to $25 each (some of these Books are either out of print or hard to find!). At 61 books that's a value of up to $1500! If you paid an average of $10 per book, that would still be $610! Here is what's on offer in "Your Library for Personal Success " (remember you'll get all 61 Classic Self Help ebooks including "Your Personal Road Map for Success" eWorkbook! ): Plus 5 Bonus eBooks, Plus a surprise eBook by Wallace D. Wattles if you order Today! "Your Personal Road Map for Success" by Donald Gordon Carty - A step by step workbook guide for anyone interested in Success  full of tips, questionnaires, self analysis, and exercises! This eWorkbook will teach you how to make better use of your unlimited potential and become successful in all areas of your life. This is a "Practical" course which, in a short time, will guide you to the summit of the art of living and success. "Attaining Your Desires" by Genevieve Behrend - Written as a complete seven-lesson course in dialogue form, between a "Sage" and a "Pupil." The Sage is the famous author and teacher, Judge Thomas Toward; the Pupil is you! "The Varieties of Religious Experience" by William James - It's an intellectual call for serious religious tolerance--indeed, respect--the vitality of which has not diminished through the subsequent decades! "Your Invisible Power" by Genevieve Behrend - This one takes you right to the heart of manifesting "things" or conditions that you want in your Life! "Think and Grow Rich" by Napoleon Hill - This is one of the most famous books ever written; even today, many successful businessmen attribute their success to this book! Here are money-making secrets that can change your life. "The Master Key System" by Charles F. Haanel - The Master Key System is the only 24 Lesson presentation of the Creative Power of Thought. It teaches the ultimate principles, causes, effects, and laws that underlie all attainment and Success. Reputed to have been read by Bill Gates, this book contains lots of little gold nuggets of wisdom. "As a Man Thinketh" by James Allen - Partly responsible for the creation of the entire personal development industry. Most contemporary Personal Developement authors and teachers credit this little book for providing foundation to their principles. "Acres of Diamonds" by Russell H. Conwell - In these pages we learn the virtues of earning money through honest, hard work. We learn to look for opportunities to serve others in our own back yard by simply finding a need and filling it. "The Science of Getting Rich" by Wallace D. Wattles - Expertly guides us toward financial success by providing the tools to spiritual growth through the acquiring of riches. "Fundamentals of Prosperity" by Roger W. Babson - "What They are and Whence They Come". Babson sees clearer and farther than any businessman and has the courage and devotion to say what he sees. (1920). A great addition to any Christian collection. "The Science of Being Great" by Wallace D. Wattles - This is truly a treasure: A powerful message that will be of value to every person who seeks true fulfillment and the awakening of highest potential. "think, Think, THINK" is the message. "The Magic Story" by Frederick Van Rensselaer Dey - Very important and life-changing story. See for yourself! "How to Live on 24 Hours a Day" by Arnold Bennett - This classic personal time-management book originally published in 1908 has inspired generations of men and women to live deliberate lives. "The Power of Concentration" by Theron Q. Dumont - A book about concentration: its importance, and how to train the mind to concentrate. "The Art and Science of Personal Magnetism" by Theron Q. Dumont - 'Magnetism' is what these old-timers coined what we now know as Energy. This book by Theron Q. Dumont will show you how to harness and use that energy. "The Secret of Success" by William W. Atkinson - A course of Nine Lessons on the subject of the Application of the latent Powers of the individual Toward Attainment of Success in Life. "Thought Vibration" by William W. Atkinson - Contents: Law of attraction in the thought world; Thought-waves and their power of reduction; About the mind; Mind building; Secret of the will; Law, not chance; Training the habit mind; and much more. "Thought-Force in Business and Everyday Life" by William W. Atkinson - Being a series of Lessons in Personal Magnetism Psychic Influence, Thought Force Concentration, Will Power and practical mental Science. "Practical Mental Influence" by William W. Atkinson - A course of lessons on Mental Vibrations, Psychic Influence, Personal Magnetism, Fascination, Psychic Self Protection. Containing Practical Instruction, Exercises, Directions etc. Capable of being understood, mastered and demonstrated by any person of average intelligence. "Character-Building Thought Power" by Ralph Waldo Trine - A thought, good or evil, an act, in time a habit, so runs life law, what you live in your thought world, that sooner or later you will objectified in you life. "The Greatest Thing Ever Known" by Ralph Waldo Trine - The moment we fully and vitally realize who and what we are, we then begin to build our own world even as God builds his. "This Mystical Life of Ours" by Ralph Waldo Trine - A book of suggestive thoughts for each week of the year. Fresh beginning; Supreme fact of life; Not repression but self mastery; and much more. "The Man who Knew" by Ralph Waldo Trine - Contents: Time, need, the man; Getting this, you have all; love and the power of life; I am a man as you are; He called it "The Way"; Sons of men living as sons of God; Source of His genius; and much more. "The Wayfarer on the Open Road" by Ralph Waldo Trine - Being some thoughts and a little creed of wholesome living. "What all the World's A-Seeking" by Ralph Waldo Trine - The Vital Law of True Life, True Greatness, Power, and Happiness. Each is building his world from within. This book reveals techniques for prosperity and spiritual success. "Common Sense: How to Exercise It" by Blanchard Yorimoto-Tashi - In these pages, you will learn how to acquire and develop common sense and practical sense, how to apply them in your daily life, and how to utilize them profitably in the business world. "The Analysis of Mind" by Bertrand Russell - All of his ideas are clearly stated and made more apparent with the use of simple illustrations. He covers all aspects of what we presently call our mind and allows us to judge for ourselves the relative importance of each aspect. "The Creative Process in the Individual" by Thomas Troward - Asserts that heaven is a state of consciousness and conditions where we experience Light, Joy, Peace, Abundance etc. in life now. And since heaven is eternal, that means it is past, present and future and forever. Along with his lecture-series: revolutionary. "The Dore Lectures on Mental Science" by Thomas Troward - But if we grasp the truth that the thing is already existent in the thought, do we not see that this transcendent Omega must be already in the Divine ideal of every one of us? "The Edinburgh Lectures on Mental Science" by Thomas Troward - How we are "distribution centers for Divine unlimited creative power". Leads you to understand the Laws of Cause and Effect and The Descent of Spirit into Matter and how to use these Laws to create your own positive unlimited life. "The Power of Silence" by Horatio W. Dresser - An interpretation of life in its relation to health and happiness. The art and science of the inner life investigated in the freest spirit without regard to specific doctrines. "Within You is the Power" by Henry Thomas Hamblin - The enlightened message of this book moves forward in time with grace and ease, and serves to help bring the inner power of mind and spirit onto harmony with Universal Law. "The Life of the Spirit" by Henry Thomas Hamblin - It is simply a beautiful book, one that hits straight and deep in the heart. It is full of truth and undoubtedly God inspired. "The Power of Thought" by Henry Thomas Hamblin - This book shows that you can , by changing your thoughts and mental attitude, "reverse the lever" and come into harmony with the Divine Idea. When this is accomplished your life will blossom like the rose. "The Mental Cure" by Warren Felt Evans - Illustrating the Influence of the Mind on the Body, Both in Health and Disease, and the Psychological Method of Treatment. "A Textbook of Theosophy" by C.W. Leadbeater - Great overview, written in a straightforward and easily understandable manner. Discusses the evolution of life, man, the planet and our purpose here without being dogmatic. "The Science of Mind" by Ernest Holmes - Using creative techniques, Holmes guides you in easy-to-follow steps toward mastering the powers of the mind to find purpose in life. Includes explanations on how to pray and meditate, heal oneself spiritually, find self confidence, and express love. "The Greatest Thing in the World" by Henry Drummond - Drummond, a nineteenth century Christian missionary, lays out his case that Love is the key ingredient to a successful life with precision, logic and eloquence. "Self-Help; National and Individual" by Samuel Smiles - This literary hybrid turns biography into an inspirational medium that awakens the reader to their own potential and instills the desire to succeed. The precursor to today's motivational and self help literature. "The Multiple Mentality Course" by Harry Kahne - The original "multitasking" training system. Want or need to do 2 or more things at once? Read this! A true course in Right/Left Brain training. "Your Forces and How to Use Them" by Christian Larson - Treatise on the nature of soul and its attributes of Wisdom and Supreme Power. "How to Find Your Real Self" by Mildred Mann - There is certainly nothing more necessary in the world today than a practical philosophy of life. One which is liveable, useable, expendable. "Self Mastery through Conscious Autosuggestion" by Emile Cou� - Arguably one of the most important people of the 20th century, this man invented Autosuggestion (autogenic training) for use in healing and improving oneself. "Fables" by Aesop - A collection of more than 300 fables by the ancient grandmaster of fables himself. Great stuff to think about and read. "The Manual" by Epictetus - Could be called "the very first self-help book." This Greek philosopher wrote a small but powerful tractate on living a content and happy life. "The Prophet" by Kahlil Gibran - This is pure food for thought, by a well-known author. A brilliant man's philosophy on love, marriage, joy and sorrow, time, friendship and much more. His words have a power and lucidity that in another era would surely have provoked the description "divinely inspired". "The Madman" by Kahlil Gibran - Equally as important as "The Prophet." Thought provoking collection of life affirming parables and poems. "Walking" by Henry David Thoreau - One of the greatest American authors himself talks about walking; serenity, meditation; peace. Order NOW and receive these 5 Personal Transformation eBooks Plus a Special Surprise eBook by Wallace D. Wattles - FREE. Great Inspirational Stories. You can begin right now to build and experience a whole new fulfilling life. One you will embrace and treasure for having the courage to discover. You can begin that new life in Minutes, by purchasing Your Library for Personal Success NOW. Copyright � 2005 Personal Development Institute All rights reserved.